The Super 8s and the Championship in general came to life last weekend. We saw brilliant games in Omagh, Newbridge and Clones as we edged towards the business end of the season. 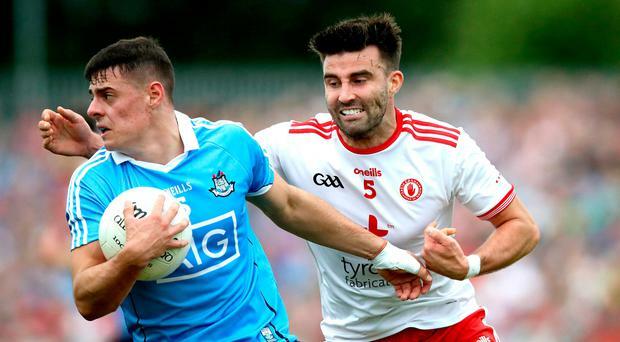 To my mind there are three bands of teams within the Super 8s, with Dublin out on their own as top dogs and showing no sign of slowing down. Behind them there is a chasing pack of Galway, Tyrone, Donegal, Monaghan and Kerry, with little between those teams. What also really impressed me is that their levels of desire and hunger show no signs of waning and that's down to the management set-up. They played like they had never won an All-Ireland, let alone going for their fourth in a row, and also continue to unearth new stars. The raw materials are there; a decent system and the forward talent to hurt anyone, but they just need to be a little bit more ruthless. They had goal chances they missed against Kildare, while they'll miss Paul Conroy around the middle as the Championship rolls on. Back when they lost to Monaghan it was hard to imagine a scenario where they'd be ranked third in this list, but they have rebuilt well through the back door. If they can maintain the pace and aggression they played with against Dublin they will be close and that game will bring them on enormously. Last weekend also showed that Tyrone have real quality on the bench. Kieran McGeary, Mark Bradley and Rory Brennan all came on to good effect, so they have depth. There's a youthfulness about them and they'll improve with every outing. The Ulster champions competed with Dublin without ever really threatening. I'm surprised they didn't push on in the last 10 minutes but they seemed to be happy to sit back and take defeat, which isn't a good sign. They were five up against Roscommon at half-time last weekend, but didn't kick on then either. That could be significant because if Tyrone and Donegal draw on Sunday week it means Donegal could lose out on scoring difference. Transfer Target:Michael Murphy - Game management has let Monaghan down on occasion and there's nobody better than Murphy at controlling things. Galway are a good side and there was no disgrace in losing to them. I think they needed to win more ball against Galway and if they could have done that they would have been OK. Transfer Target: Ciarán Kilkenny - Kildare have the physicality and are a team on the up. A general on the 40 to orchestrate, control, set up and score is what they require and there's no one better than Kilkenny. Kevin McStay has put in a huge amount of work, but they have lacked leadership on the pitch and that was evident against Tyrone. They have quality forwards but have struggled at the back. Transfer Target:Jonny Cooper - Teams have had plenty of success against them by putting strong men on the edge of the square. A strong, dogged figure like Cooper would have tightened their defence.